During some tests with metro availability in the lab with NOS 4.5 and vSphere 6 I noticed that it was not possible to pair the two Nutanix clusters as usual. After the remote site was configured on both clusters, it was not possible to configure metro availability due to the reason that no compatible remote site was found. All checks were green beside the warning that the matching container was not empty (which is a requirement). Of course the container did not contain any VMs, it was just created prior to the pairing of the two clusters. A quick look at the container / datastore via the ESXi shell showed that the warning was correct, there are some hidden files on the newly created datastore. With some testing together with the Nutanix support we figured out that it seems that there have been some changes within vSphere 6 and SIOC which creates this hidden files even if you didn´t configure SIOC. Also you are not able to delete these files, because the directly appear again. For the moment there is a quite simple workaround to get metro availibilty configured anyway. 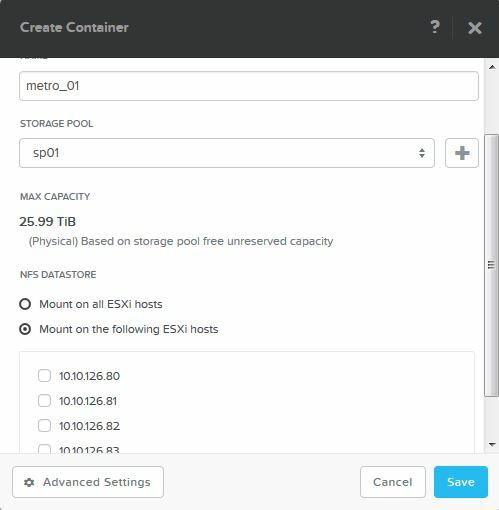 Make sure that you don´t mount the container you want to use on the standby site to your ESXi hosts when you create it. Just select “Mount on the following hosts” and remove all checkmarks. Then you can go ahead and configure metro availibitly as usual. After metro availibility is setup make sure that you now mount the standby container to all hosts. than’s you save me!!! i resolve an issue with yr recomendations.